Kiev’s military operation in eastern Ukraine has left 181 people killed, including 59 of ruling regime troops, and 293 injured, according to the country’s Prosecutor General. Oleg Makhnitsky announced the recent figures at a press conference. However, it was not clear whether the death toll included casualties among self-defense forces. The Prosecutor General has also added that over 220 people have been abducted, including 12 foreign citizens, since the uprising started in Lugansk and Donetsk Regions. "Six hundred and seventy-five criminal enterprises connected with subversive activities, terrorist acts, and violation of the territorial integrity of Ukraine are currently being investigated,” Makhnitsky told the media. The spokesman for the anti-terrorist operation, Vladislav Seleznev, put the number of self-defense force personnel killed at 300, according to RIA Novosti. Kiev has been conducting its “anti-terrorist operation” in eastern Ukraine since April, following a mass uprising against the coup-appointed government, demanding broader independence from the capital. Following the May 11 referendums, in which the Lugansk People’s Republic and Donetsk People’s Republic voted for the two regions’ independence and proclaimed themselves sovereign states, the military operation by Kiev troops has intensified. The day after the presidential elections on May 25, the likely winner, billionaire Petro Poroshenko, announced that the military operation in the southeast of the country would continue, demanding “it must be more effective, and military units must be better equipped." This is despite Kiev’s troops already actively using heavy artillery units, mortars, aviation, fighter jets and helicopters, APCs and tanks in their operation in the south-east. Just a few hours after the early results of the elections were announced, Ukrainian troops stepped up its military activity and deployed fighter jets and helicopters at Donetsk International Airport in an attempt to win it back from self-defense forces. More than 50 civilians and as many self-defense troops were killed in the subsequent clashes, local militia estimated. 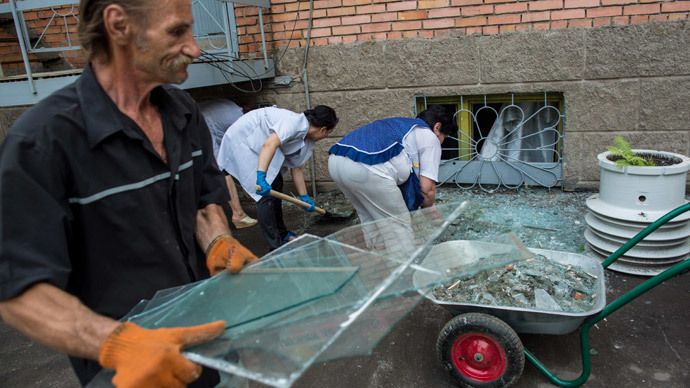 On Wednesday, May 28, Kiev troops targeted civilian quarters of Slavyansk, for the first time shelling one of the city’s schools and a kindergarten. All the pupils and teachers were quickly evacuated from the school as the shell hit the roof and exploded right above the hall where children played. The shelling also damaged a block of flats and a dormitory in the city’s teachers’ college, shattering glass in the windows of the college. 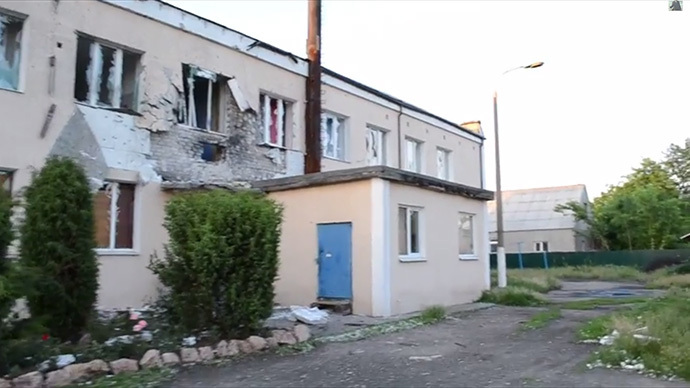 Shortly afterwards, the Ukrainian military shelled a children’s hospital, also in Slavyansk. 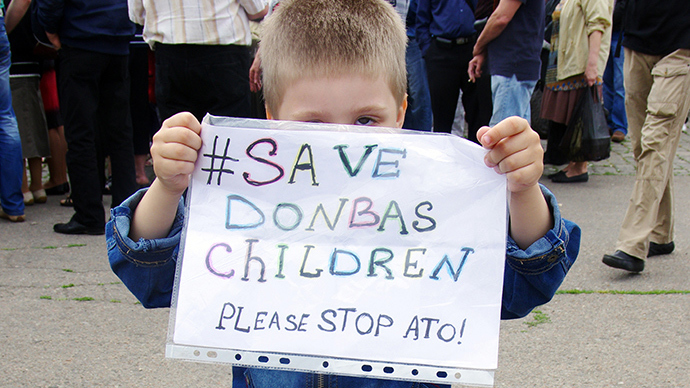 This past weekend, over a thousand people rallied in Donetsk demanding that children be protected from Kiev’s assault. 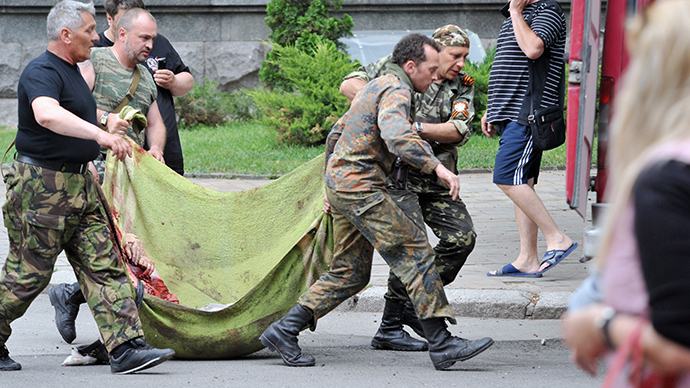 In a recent move, Kiev deployed fighter jets to the city of Lugansk, eastern Ukraine, where eight people died after an explosion in a regional administration building on June 2. Wounded people were trapped inside the administration HQs, which caught on fire. Locals outside the building were urged to flee the area as unexploded shells were found in the park nearby. “Ukraine’s Air Force struck Lugansk downtown at 4pm. Military aircraft made a targeted strike, deploying cluster bombs. The administration building is partially destroyed,” the government of the self-proclaimed Lugansk People’s Republic (LNR) said. While Kiev has denied launching the fatal attack and blamed on the explosion on “terrorists” trying to launch an anti-aircraft missile, the leader of the ruling Party of Regions, Aleksandr Efremov, has called it “unprecedentedly” cruel crime and demanded it be investigated in The Hague court.